Since its release in June 2007, eBuddy Mobile Messenger accelerated significantly its growing with 5 million downloads in July 2008. This Java ME client enables you to connect to your hotmail account from your mobile phone. Just like any other instant messaging software, eBuddy Mobile Messenger allows its users to chat with contacts all over the world. The number of contact is completely unlimited as well as text exchanging. Users can insert quicktext, view profile, and add emoticons. The application lets its users to send SMS notifications to offline contacts which can be done directly from contact lists, group chat or most recent chats. Users can send and receive offline messages. Apart from that, users are also allowed to take and set a mobile phone photo as their personal avatar. It is also possible to send and receive picture files to/from contacts. 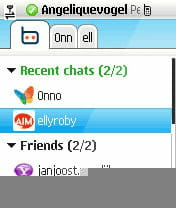 MySpace, Windows Live Messenger, Yahoo!, AIM, Google Talk, ICQ, and Facebook for IM are supported. As for mobiles, Sony PSP, iPhone and iPod Touch are supported. The application allows its users to chat through mobile phones. eBuddy Mobile Messenger is free from bugs. VoIP or Skype text chat not supported. Latest update on February 5, 2015 at 04:58 AM.